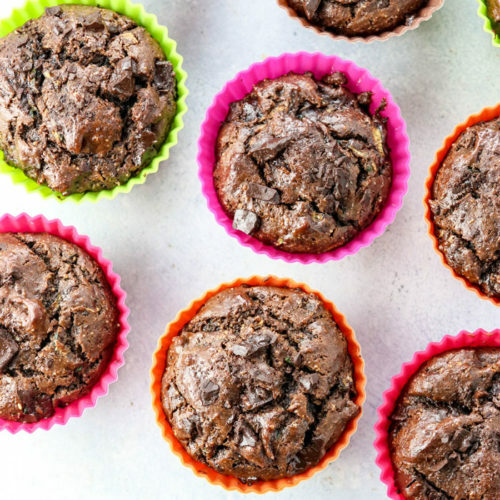 These healthy chocolate zucchini muffins are super-moist and fluffy, without the use of flour or oil, and they’re so easy to make. I can’t think of a tastier way to eat zucchini. Zucchini is a great source of vitamin C (just one medium zucchini has 50% of your daily vitamin C needs!) and manganese, which is thought to contribute to healthy bones, and also contains healthy omega-3 fatty acids and plenty of fiber. I love sneaking zucchini into recipes, as its flavor is mild and can go completely unnoticed, like in my Dairy-Free Chocolate Cheesecake and Bean-Free Zucchini Hummus. Summer squash is particularly high in the fiber pectin, which is a polysaccharide that has been linked to naturally lowering cholesterol and improving cardiovascular health. Pectin fiber (which is also found in apples) may also help to reduce inflammation and protect against insulin resistance. 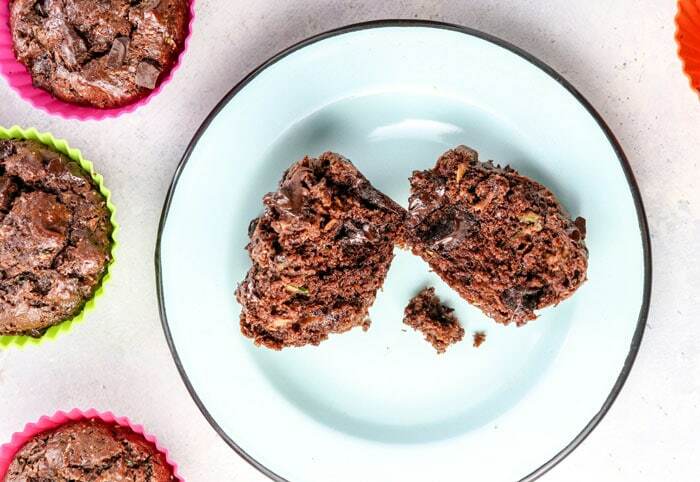 These fluffy chocolate muffins are naturally gluten-free and sweetened with coconut sugar. Made with almond butter and eggs for a high protein treat, with a sneaky serving of zucchini. Pour the shredded zucchini into the center of a dish towel, cover with the towel, and press firmly to remove some of the excess moisture. Transfer the squeezed zucchini into a large bowl. 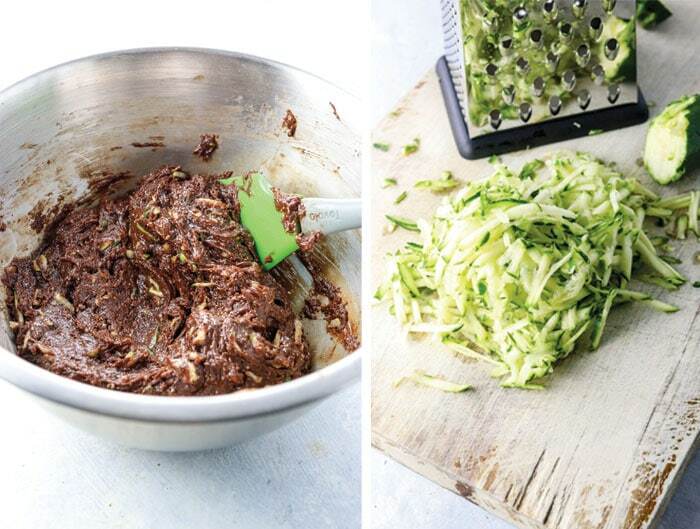 To the zucchini, add in the almond butter, coconut sugar, cacao powder, eggs, baking soda, salt, and vanilla. Stir well until a thick batter is formed, then fold in the chocolate chips, if using. Remove the pan from the oven and let them cool for at least 20 minutes before serving. You can serve them warm or cold, but I think they have the best flavor when they are at room temperature. I don’t recommend swapping flax eggs for real eggs in flourless recipes like this, because the results are usually really gooey and under-baked in texture. (If you don’t mind that, go for it!) I’ll be working on a vegan alternative, so stay tuned. 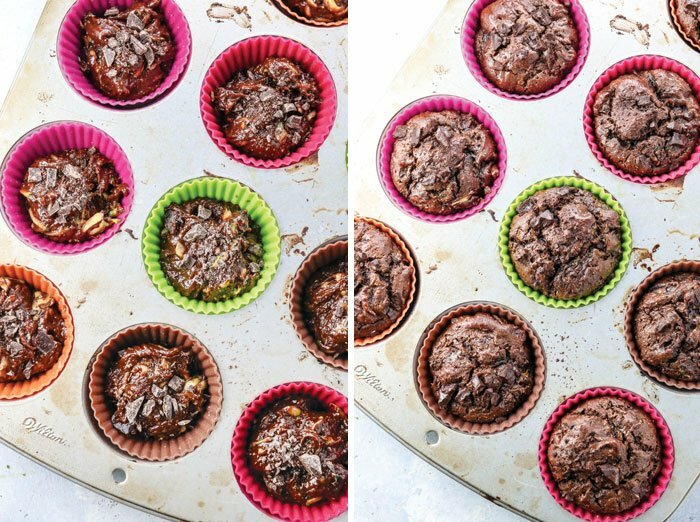 If zucchini is out of season where you live, try these flourless chocolate pumpkin muffins instead. I haven’t tested this recipe with a liquid sweetener, like maple syrup or honey, so I’m not sure how that will work for you, but my best guess is that 1/2 cup of honey would replace the coconut sugar just fine in this recipe– the results might be slightly more moist. As always, if you make a modification, please let us know how it worked for you in the comments below so we can all benefit from your experience. Reader Feedback: What’s your favorite way to use zucchini? These muffins are AMAZING! my kids ask for them A LOT! I use a 1/2 cup coconut sugar instead of 3/4 cups, with no other changes, and we think they’re perfect, just the right amount of sweetness. 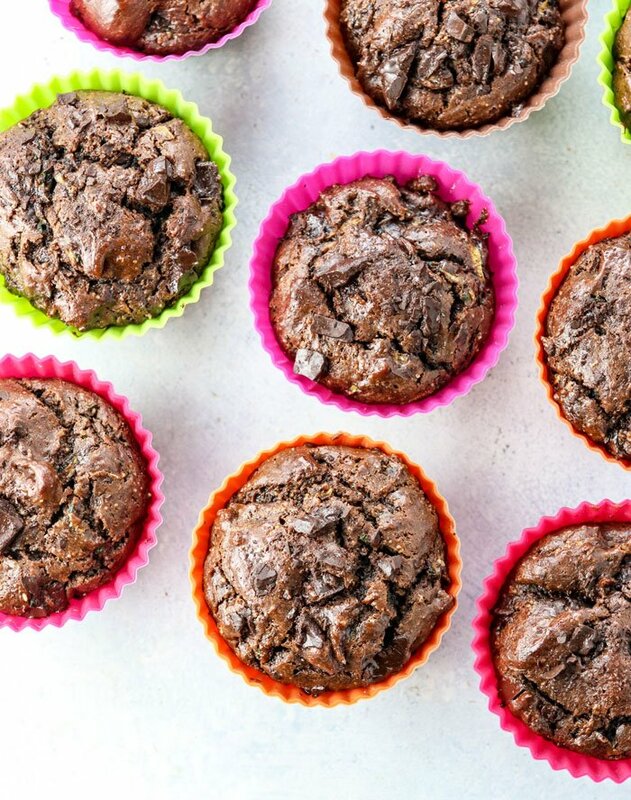 Wow these really are the best chocolate muffins ever! Makes a good treat for my picky 2 year old. Little does he know there’s a veggie hiding in there. OMG!!!!!!! Delicious!! I used monk fruit sugar and white chocolate chips and even my husband and daughter loved them!!! This will be a weekly recepie in my house!!! Thank you!!! Oh! I’m sharing this recepie translated in Spanish!! Of course with your page included. Hi Megan I clicked on this recipe because of interest in high protein. I don’t see it mentioned could you let me know and also the carbohydrate grams. Thank you I would like to try this recipe. I used 2 chia eggs + 2 Tbsp of chia and added 1/4 C of honey. I baked them for 25 minutes. These turned out soft on the tops and gooey in the middle. Such an easy and yummy recipe, even my picky toddler asked for seconds! Thanks Megan! AMAZING! They didn’t turn out like they did in the picture, but were more fudgey, which was still absolutely delicious. Couldn’t even taste the zucchini! I’m so glad your family loves them! Recently found out my daughter is allergic to eggs. Any luck with an egg-free Verizon of this recipe? We love this so much, and have been bummed not being able to bake it. Never Mind! I figured it out. Used 2 flax eggs and added 1/4c.flaxseed meal. Held together beautifully. Oh and 2 droppersful stevia extract instead of coconut sugar and increased vanilla to 2tsps. Thanks for sharing! I haven’t gotten around to testing an egg-free version yet, so I appreciate your comment! Made these yesterday and OMG soooo good!! We’re new to healthier eating so I was skeptical about how they were going to taste but they were AMAZING!!! I couldn’t even tell they didn’t have flour! Will be trying more awesome recipes off of your site soon! Seriously so good. No-one would even guess there was zucchini in it. I hate zucchini but tore these up haha yum. Absolutely delicious and so easy!! Im not an experienced baker and these came out perfectly. Moist, light and so nutritious. Chocolate heaven. Thank you so much for sharing this recipe. Hello from Belgium! Thank you for the recipe, absolutely great idea to take zucchini as a base! I’ve experimented with an egg-free and cacao-free version (unfortunately can’t eat it either), and replaced almond butter with almond meal (that’s what I had at hand). It worked out perfectly well! So here is what I’ve done: 2 cups shredded zucchini, 1 and 1/3rd cup almond meal, 2/3rd cup buckwheat flour (ground in the coffee grinder), 1/3rd cup carob powder,1/2 cup coconut sugar (carob is sweet by nature, so you need a bit less sweetening), 1 teaspoon baking soda, 1/4 teaspoon fine salt, 1 teaspoon vanilla, 2 teaspoons white wine vinegar. The trick here is that if you try to mix it by hand, it will be lumpy, so I put it into a food processor and let it run for a minute or so. My son of 8 just called it perfect. How did you figure the calories? I came to about 165 vs 2q8. I am comparing recipes to find best lower cal. So these seem closer in calories to a regularuffin with flour. One of the negatives I keep hearing about almond flour is that you end up with more calories as well as more than a healthy serving. But that doesn’t look like the case here. I used the calories from the almonds as I blended myself. The oils are already in them. So I was wondering if maybe the calories in yours might be less or if there is something seeing to suggest issues with calculations I see in other recipes. made these exactly as written (except maybe left off a scant amt of the coconut sugar)–AMAZING! I’ve made this recipe today and I simply lovehese muffins!!!. I’ve used peanut butter instead of almond butter and half raw sugar, half raw honey as sweetener because coconut sugar is a bit hard to find here; the result? They’re soft and taste delicious, that’s why my family loves them. I just wanna thank you for sharing such an amazing recipe! I think I’m going to make almond flour banana bread tomorrow. I cut back to 1/8 c. coco sugar (+ chopped dark chocolate), and they were still fabulous. I love this recipe, they are absolutely delish, even my husband agree! Actually I like all of your Recipies I have made! I don’t even know where to start with these, but I’ll try… First off, I love having yet another use for the gobs of zucchini we’ve been getting from our garden (yahoo). Second, they’re chocolate, so immediate yum factor. Third, the almond butter gives them a quasi-gooey texture, which is pure awesome. We’ve been enjoying them as a breakfast muffin, as well as a dessert. It really doesn’t get much better than that. Thanks once again, Megan! Excellent recipe! I replaced the 3/4 c sugar with 1/2 c maple syrup, and I used peanut butter. Everyone loved them, including the kids. Thanks for the recipe! Thanks for sharing! Glad everyone enjoyed them!! Just made these using local honey and peanut butter in place of coconut sugar and almond butter and they turned out amazing! Even the kids loved them! Definitely our new goto for all of our garden zucchini…Thanks! Hey Amanda, did you replace the 3/4C coconut sugar with the same amount of honey? I love this idea as I don’t typically have coconut sugar. I’m making these right now. One batch with sun butter and a second batch with cashew butter. I only used a half cup of sugar. This recipe is so easy. Thank you for posting it. Just wondering if a serving size would be one muffin if eating for a snack. Thanks. These muffins look so delicious and beautiful. When I first glanced at the recipe, I was super excited because I didn’t see the eggs listed. We try to eat a mostly plant-based diet, but I do buy eggs laid by humanely raised, pastured chickens…as these eggs are nearly $7 a dozen, I am loathe to use them in my baking adventures. However, these muffins are just too tempting. I am planning a blog post about back-to-school life and have been searching for recipes that can serve as nutritious breakfast, snack or lunch box items, and these muffins would fit all three categories. I will sacrifice our precious eggs for this recipe. Provided i do them justice, would you mind if I take a photo of them and include them in my post with a shout out to you and a link to this recipe? I think they’d make a great addition to the recipes I’ve already got lined up! Yes, you can always share a link back to my recipes! I appreciate you thinking to include them. Are you using unsalted almond butter? Made these last night with cashew butter (since that’s what I had). these are amazing. Though zucchini is plentiful, we have more yellow squash than what we know what to do with. Megan do you think the two are interchangeable in this recipe? I can hardly wait for the eggless version! ! ! ! ! They look Delicious. Wow, thanks for letting me know! I’ll have to check that out next time I’m at Trader Joe’s!! looking forward to the vegan version! My favourite is just like what you do. 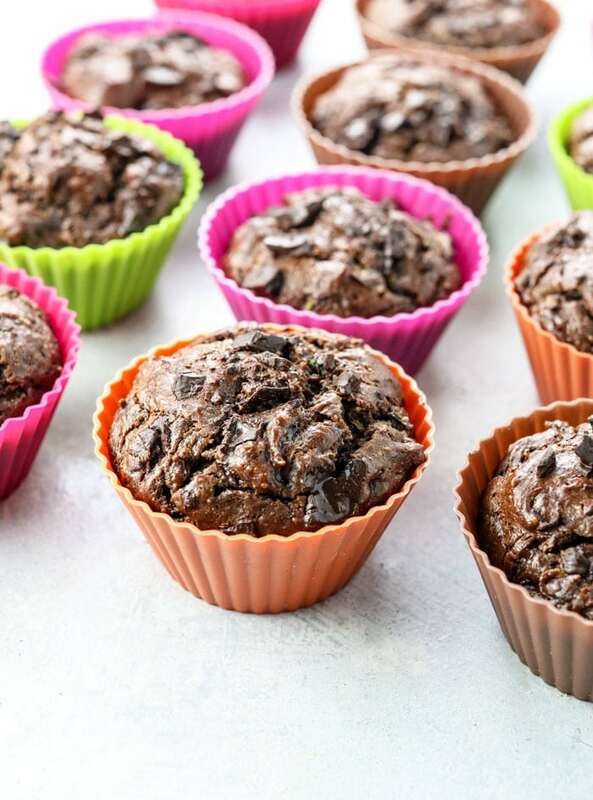 Chocolate zucchini cakes, zucchini fritters, quiches, spaghetti sauce, Soups, they are aweSome in smoothies sonce they really are pretty tasteless. I Also like to add it to home made apple sauce. (Or butternut squash puree with lots of cinnamon) My mother taugh me to do that as a way to “stRetch” out the applesauce.